Buying a Tactical Backpack – What is important? Overall, when it comes to tactical equipment, a tactical backpack is one of the most basic items. Therefore, if you are a person who loves outdoor activities such as camping, hiking, or travelling, choosing the best tactical backpack is very important. However, it’s not really easy to choose one as there are quite a lot of things to consider. That’s why I’m here to help you guys. So if you don’t know where to begin, just read on for more useful information. I don’t know about you but for me, a tactical backpack is one of the most valuable companies you should have when going outside. Nowadays, apart from military use, tactical backpacks have been becoming more and more popular in civilian life. And in my opinion, there are 2 main reasons why you should get yourself a tactical backpack. First, they are durable and rugged. There must be a reason why these special backpacks are used for military purposes. Seriously, they are more resilient as they’re designed with durable materials – tough polyester, and nylon. Therefore, they can totally support you even in extreme environments such as deserts, mountain peaks, frozen places. Generally, they can last for decades. And to be honest, mine doesn’t have any sign of wear and tear although I’ve been using it for almost 10 years for hiking. Second, they provide great convenience. A lot of people choose tactical backpacks rather than normal ones. The reason is that tactical backpacks coming with compartmentalized pouches for extra convenience. Nobody wants to look around for hours just to find their cell phone or gadgets which are hidden in the other stuff, right? Additionally, with a few excellent functions such as a padded belt and waistband belt, everything will be much easier and more comfortable to wear it for hours. Also, they have more filling in shoulder bands, thus, they’re more breathable. Besides, with a padded belt, the weight you’re bearing on your shoulders and hips will be distributed evenly. Just imagine how annoying it would be if your backpack keeps swinging from side to side when you’re walking under the scorching hot sun. The first difference between the 2 types of backpacks is the size. Actually, this is quite obvious because tactical backpacks are designed for military use so they must be larger and heavier than normal ones. That’s why they can carry more items and gear. Another big difference is what these 2 types are made from. In fact, normal backpacks such as traditional backpacks or gym bags are made from synthetics or cotton mixes. Hence, these backpacks can’t withstand extreme environments (deserts, jungles) like tactical backpacks do. Tactical backpacks are made from the most durable material since they’re commonly used for military services, outdoor activities. 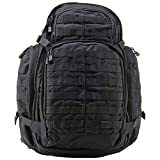 As mentioned above, tactical backpacks are likely to come with special features such as padded waist straps, padded compartments, multiple pouches, and so on. The reason is that they are specifically designed for various scenarios. 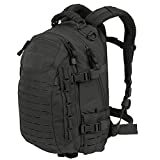 With the high versatility, you can use a tactical backpack for different uses, from everyday travel to deployments, to cross-country travel and so on. However, in a normal backpack, you can find only 1 or 2 pockets as well as compartments. The last difference is that tactical backpacks come in a lot more patterns. In reality, they are commonly used by the military as much as service members have to wear different patterns. It is not only “camo” but also a lot more patterns for different assignments. So, the question is “How can I choose the best tactical backpack for the next outdoor adventure trip?” Don’t worry, even though there are quite a lot of things to consider, I’ll try to help you as much as I can. This is one of the most important things when it comes to tactical backpacks. First, you need to remember that they are much heavier than other backpack types. This is because they provide more volume and more pockets and compartments. With that said, you still need to choose a tactical backpack which is light enough. A lightweight tactical backpack always allows you to move faster and easier while still provides everything you need for the trip. Additionally, a lot of manufacturers make their backpacks lighter with cutting-edge materials providing extra durability as well as abrasion-resistance while being light. For me, a tactical backpack weighing less than 2.5 kilograms is not a bad choice for general outdoor purposes such as hiking, camping, fishing or hunting. This material is very strong and results in a durable backpack. Also, it can dry quickly. Hence, if you’re looking for a backpack that can support you in wet weather, just go for this one. This one is created by weaving large threads into traditional nylon. Therefore, it is even more durable and stronger than the previous material and has become more popular for anyone who needs a sturdy backpack. All things considered, this one is the best when it comes to military use and of course, a rip-stop unit is quite expensive compared to the traditional nylon one. However, if you want something very durable for a hiking or backpacking trip, it’s not a bad idea to invest in a rip-stop nylon unit. Polyester isn’t as durable and strong as nylon. Furthermore, it takes longer to dry but you can totally choose this material as it is more UV resistant than the others. Therefore, if you often go camping or hiking in the summer, then this one can be your good option. Those old-fashioned backpacks you have seen in many movies were made from canvas. While this is not a new material, it is still durable to some extents. However, a disadvantage of a canvas backpack is that it is relatively heavy. That’s why it’s only suitable for short trips. In my experience, a lot of tactical backpacks are made out of nylon because it provides great durability, abrasion resistance and it’s also lightweight. If you’re a serious camper, hiker or backpacker, then nylon or rip-stop nylon is more than enough. Remember that this material comes in different denier and the higher the denier it has, the more durable and heavier it is. Additionally, a high-quality tactical backpack usually uses nylon coming with a denier value of about 500 at least. However, if you are looking for something for your light-weight backpacking and hiking, a denier value of less than 250 is fine. Besides the main compartment, a tactical backpack should feature enough outer and inner pockets coming with different sizes. This will help you organize your items and gadgets easily. To be honest, nothing is more uncomfortable and annoying than struggling to find something under a bunch of stuff when you really need it. That’s why it’s very important to know where every item is at any moment, so that you can react quickly to any situation. If you often go camping or hiking, then a tactical backpack with a lot of pockets will be your best company. Hydration system compatible backpacks feature a sleeve or pocket for water reservoir and an opening for this tube. A hydration system will enable you to hydrate without you having to take the backpack off and ask others for a bottle from the backpack. Trust me, it is very uncomfortable when you have to do that anytime you are thirsty. So, my advice is to choose a tactical backpack which has a built-in hydration system. It is also beneficial when your backpack is MOLLE compatible since MOLLE webbing allows you to attach other MOLLE compatible gear to your backpack. This special system consists of durable nylon rows which are stitched to the main fabric. A good tactical backpack must be built for heavy usage but that doesn’t necessarily mean it is not comfortable for users. Actually, when you are on a long trip or on a hike, it is essential that your bag is comfortable to carry for hours. Now, you may ask: “How can I know if a tactical backpack is comfortable or not?” Well, you just need to look at online reviews. Those people have already bought and experienced the backpack so they know how comfortable it is better than anyone. Also, I suggest you choose a backpack which comes with a hip padding and straps. These features make it easier to carry, especially long distances. Also, it’s important to look for air channels and wide straps. The capacity of a backpack is what tells you how much gear you can carry. However, remember that the available space also depends partly on the shape and number of compartments. However, bigger is not always better with regard to choosing the best tactical backpack. To be honest, the more volume a backpack has, the heavier and bulkier it will be when full. Therefore, you will need to consider how much volume you are going to carry with you. And this depends primarily on the type of your outdoor activities and the length of your trip. If you still need a specific number, then a 30-liter backpack is acceptable for your day trips. If you are looking for a backpack which can help you with multiple nights, then a backpack with a minimum capacity of 40 liters is a good choice. Keep in mind that no matter what you want to choose or what you are going to do, your budget is always a consideration. But it’s more crucial to get a good backpack which meets your needs than to save money, right? To be honest, the color of a backpack really comes down to your personal preferences, especially if you’re on a hike or other outdoor activities. A lot of people prefer military-style camouflage, however, there are so many different colors available for you to choose from. However, if you are looking for a bug out backpack, it is an exception. This is because a camo color could alert others that you’re prepared and might be carrying supplies. This 2-day tactical backpack offers a volume of 25 liters which is enough for lightweight backpacking or hiking. It is also made of a less robust material when compared to other products on the market. One of the things I love most about this one is that it features a laser-cut MOLLE system. This makes for lightweight and low profile water resistant attachments. Furthermore, there is a foam padded ventilation system which helps you to make sure that your backpack has proper air flow. This product is a well-designed bag made of high-quality materials. The compartments are also very practical so you can organize your gadgets easily. Another impressive thing about this unit must be the vent system, and this is what helps you keep the pack dry for a long time. However, a downside of this one is that it is quite noisy. In details, the buckles make so much noise when closed and therefore, the backpack rattles when you move. To be honest, this is not a great thing when it comes to a tactical backpack. Best for: Anyone who loves the military stuff and short outdoor trips. This 5.11 Rush 72 backpack is very popular among hunters, outdoor enthusiasts, and military personnel. The reason is that it is made of abrasion-resistant 1000-denier nylon and therefore, it provides great durability. It also offers a volume of about 55 liters so you can totally use it for any outdoor activity lasting up to even 3 or 4 days. This product features a spacious main compartment and a small front compartment. The stash pocket between these 2 compartments is ideal for storing bigger items, for example, a helmet. The main compartment has 2 spacious mesh pocket while the front one has an organization panel allowing you to store small things like maps or pens. Additionally, there are 2 large side pockets so you can easily store water bottles and other items you want within your reach. Also, the water reservoir pocket is between the main compartment, the back panel and it fits water reservoirs with a volume of even 3 liters. Furthermore, it comes with a fairly wide and well-padded hip belt and shoulder straps for extra comfort and convenience. In this product, what impressed me the most is that it is very durable and can totally sustain wear and tear. Specifically, you don’t have to worry about the bag tearing or a strap breaking in any emergency situation. It also has a lot of storage space for your all items such as water, food, first aid kits, shelter, etc. The main compartment is quite large and there are 6 additionally pockets which are perfect for storing small items and keeping things well organized. Besides, the bag also features 2 top handles in case you need to pick it up and move quickly. Another special thing about the unit is that it is one of the most versatile tactical backpacks. This can be your best company and it can take you whenever you want to go regardless of conditions, weathers or anything else. The Explorer backpack is made from 600Dx600D polyester coming with a lot of straps, webbing, and compartments. There are also 6 different designs for you to choose from such as Drab Green, Woodland, Multi Camo, Back, ACU Camo and Tan. This Military style Paratus 3v backpack can be the best tactical backpack for anyone who goes into extreme environments. This is because it is made out of high-quality material which is a rugged 600 denier PVC backed nylon, therefore, providing extra durability. 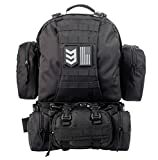 Additionally, the backpack features 2 attached MOLLE pouches, 2 large zippered compartments, and some interior pockets. These features are what make the unit more customize-able for users as you can easily store extra equipment. Moreover, this one is specifically designed to meet the requirements and standards for air travel. Therefore, this product is perfect for those who love versatility. Last but not least, the material used to make the backpack also makes it resistant to weather but still contributing to its durability. This product comes in a variety of designs as we as colors so you can suit anybody’s desires, whether you’re a man or women. Maybe this 31-liter backpack looks small at first, but it can easily carry a lot more than you think you can throw at it. This one is also comfortable and water resistant, thus, making it a good choice for any outdoor enthusiast. It can carry anything you need including blankets, water bottles, and even my 15” laptop. And even with all of these items inside, it still looks quite small and comfortable to carry. The compartment lined by a layer of fleece is good at protecting your items and warming them. Also, the 2 side pockets stretch and are perfect for storing bottles. The exterior mesh pocket is large enough for you to store a pair of shoes if needed. However, what I like most about this unit is that the straps are contoured in a way that is suited to match your spinal curve. This allows the bottom of the backpack to rest above your hip. That’s the reason why this one is very comfortable for heavy loads, even for hours. To be honest, there are quite a lot of things to consider when it comes to choosing a tactical backpack. However, I believe that if you truly understand the essence of your outdoor activities and what you need for that, it’s not that hard. Hopefully, you guys enjoyed my article and found it helpful for you to choose the right bag.